The dragon turtle symbol is very popular in classical, or traditional feng shui schools. You can find it in most feng shui shops, as well as in any Chinatown. From small souvenirs in cheap metal finish material to beautifully carved jade statues, this unusual dragon turtle image is always associated with feng shui, and it has specific meanings and uses. The dragon turtles cure is a classical feng shui cure, which basically means it has its deep roots in culturally specific Chinese symbology and folklore. Not only the dragon turtles cure is a culturally specific symbol; it is also a mythical creature. In its normal depiction, the dragon turtle has the body of a turtle and the head of a dragon, and it is usually standing on a bed of coins and ingots and also holding a coin in its mouth. The dragon turtle is often depicted with one or several baby dragon turtles on its back, as well as a ru yi ( a scepter). There are many attributes assigned to the dragon turtle cure—from attracting wealth to offering protection to improving one's career. To understand this cure, let's look at its specific energies. So, a combination of two celestial animals logically makes for a more powerful force, especially for a person who grew up in a traditional Chinese household and is very familiar with these symbols. The energy of the dragon is associated with courage, auspiciousness, and good luck; it is one of the most powerful symbols in traditional feng shui. Turtles bring the energy of stability, longevity, and protection; they are an ancient energy associated with the wisdom of the earth. As an expression combining both these energies, the mythical dragon turtle became a feng shui cure for lasting wealth (when it has coins and ingots), or a cure for protection and authority (when the image emphasizes claws and includes a large ru yi scepter on its back. To attract wealth. As a wealth feng shui cure, the dragon turtle is placed in the money area of your home or in your lucky direction for attracting wealth. 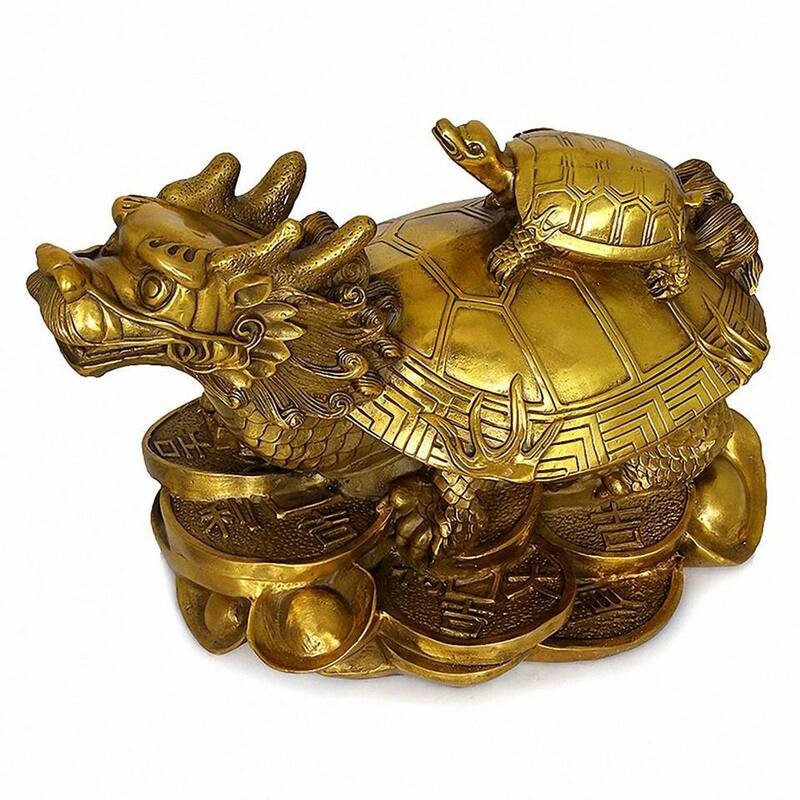 For this purpose, it is typical to choose a gold-colored dragon turtle that has many coins and ingots all around it, as well as a Chinese coin in its mouth. A baby dragon turtle on its back is also a good addition to a dragon turtle used a feng shui wealth cure. To advance a career. To use the dragon turtle in matters of business and career advancement, choose a dragon turtle with a ru yi on its back, as well as strong, defined claws. Place this dragon turtle in either the north or northwest bagua areas of your home or office, facing your lucky direction. Be sure to choose a good-quality bronze statue or one carved from a crystal or stone. To neutralize the energy of negative stars. A metal dragon turtle is also used as a feng shui cure to neutralize the energy of negative annual stars, particularly the #2 and #5 stars. In this case, it brings strong protective energies due to the fiery and courageous energy of the dragon and the watchful guardian energy of the turtle. Sometimes a dragon turtle has various designs on its back, either a whole lo shu square symbol or a Chinese sign for specific wishes, such as wealth and protection. The best material for your dragon turtle will depend on the bagua area you want to place it in. Look into the five feng shui elements and their correspondence with bagua in order to make the best choice. How Is a Chinese Abacus Used in Feng Shui?